Tasmania has the most integrated housing and homelessness system in Australia. Housing assistance ranges right across the entire housing spectrum, from homelessness services to home ownership assistance, and is aimed to match tailored solutions to a person’s individual needs. The Tasmanian Government, through Housing Tasmania, manages over 12 000 social housing properties. Around 7400 of these are public housing and Aboriginal housing. The remaining properties are community housing. This includes around 3900 homes managed by community housing providers under the Better Housing Futures initiative. We also assist over 200 households a month with private rental assistance. Housing assistance can be accessed through Housing Connect’s Front Door Service. Housing Connect is where people go for housing assistance and support, and provides one assessment for everything from emergency accommodation to a long-term home. 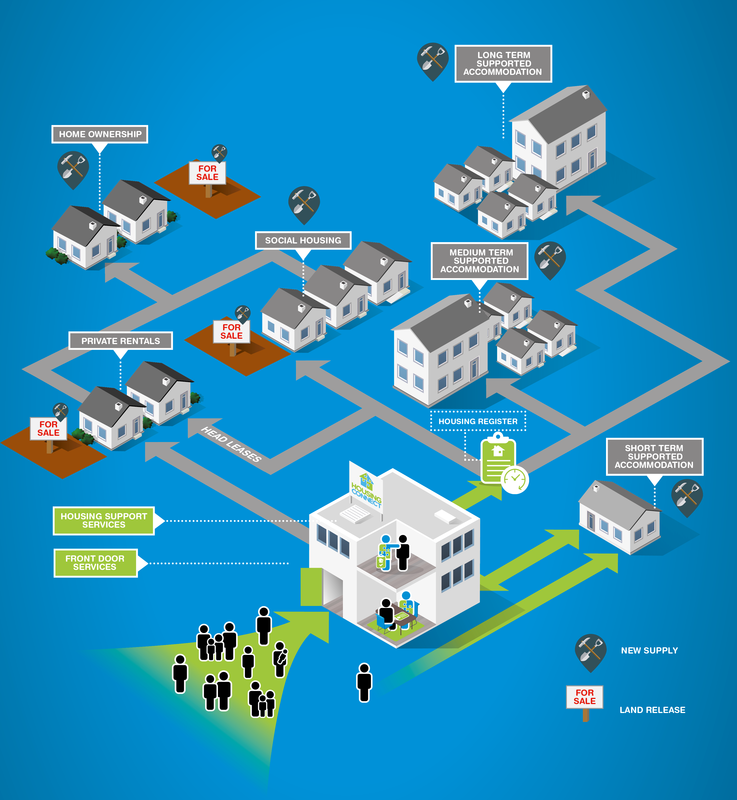 As depicted in the diagram below, there are many pathways into housing. People can apply for private rental assistance, social housing and supported accommodation, or they can be safely housed during a time of crisis. Housing Connect can also provide people with housing related support and information, advice and referral to other support services available to them in Tasmania.